During the oil boom, which was from 1925 to 1927, the town of Oscar's population grew to 1,500. Oscar's son, Wilmer D. Seay, took over the ranch, which included raising Hereford cattle and Quarter horses. The ranch is still in operation today with Sue Seay Dennis (daughter to Wilmer D. Seay). Their daughter, LaDonna Dennis Davis now runs the Quarter Horse operation, and their grandson, Zachary Smith is foreman of the ranch, which includes raising Hereford, Angus, and Longhorn Cattle. 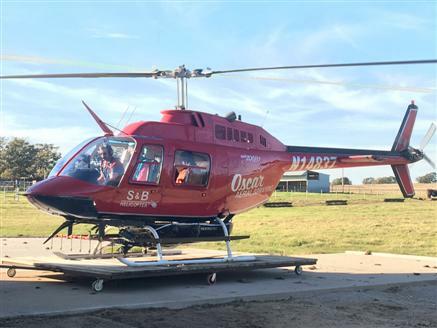 In 2010, our very own ranch foreman, Zachary Smith (grandson of Skeeter and Sue Dennis), started a helicopter business, which is called S & B Helicopter Tours. Zac is a licensed, commercial pilot of a Robinson R 44 Raven 2 as well as a certified, aerial commercial applicator. Michael Hendricks, Producer of "Bullets and Broadheads" on The Sportsman Channel, featured S&B Helicopter Tours on his show. Dennis Cattle Company and Ranch was first established in 1889. The ranch covers over 30,000 acres of land in Oscar and Grady Oklahoma and Ringgold,Texas. Oscar, OK is 18 miles southeast of Ryan, OK. The name Oscar first originated from Oscar W. Seay, a prominent pioneer rancher who settled the land in 1889 and who established the ranch. The ranch has been a member of the Oklahoma and Texas Cattle Raisers Association for over 100 years. We are also members of the Working Hereford Cattle Raisers Association. In 2009 we were given the "Excellence in grazing" award by the Jefferson County Conservation District. For more information about what else is offered, please visit their website. For scheduling call Zac at 940-704-9682 or email us at sbhelicopter@wildblue.net. Hog eradication, aerial tours, aerial spraying are just a few of the services offered! Each year, AQHA honors breeders who have dedicated their livelihoods to maintaining the integrity of the American Quarter Horse. Skeeter Dennis was honored with this prestigious award in 2007.